HS121 OCTOBER HEARTSTRINGS - One in our Heartstrings Series. Our model was stitched on 18ct. Mountain Mist Linen using #5 Perle Cotton and specialty fibers (with #5 Perle substitutions listed). Design size is 3.2” X 8.6”. Chart pack includes witche's hat button(s). Extra buttons are available. $9.00 for the chart pack. 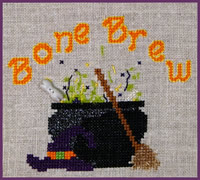 CBOT56 BONE BREW - Our model was stitched on 18ct. Lambswool Linen using #5 Perle Cotton and specialty fibers (with #5 Perle substitutions listed). Design size is 7.0” X 5.9”. Chart pack includes bone button(s). Extra buttons are available. Chart pack price is $8.00. 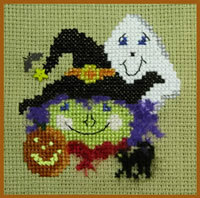 FS131 BOO - Our model was stitched on 10ct. Tula using #5 Perle Cotton and specialty fibers. Design size is 4.8” X 4.4”. Chart pack includes bat button(s). Extra buttons are available. $8.00 for the chart pack and $26.00 for the full kit. CCC01 HALLOWEEN CUPCAKE - One in our Cupcake Celebration Series. Our model was stitched on 18ct. Mountain Mist Linen using #5 Perle Cotton, beads and specialty fibers. Design size is 5.0” X 5.0”. Chart pack includes pumpkin button(s). Extra buttons are available. CBOT35 GHOUL FRIENDS - Stitched on 10 ct Sand Tula. 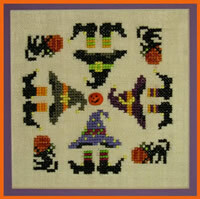 This design is 4.2" by 4.2" and uses DMC Perle Cotton #5. Specialty fiber substitutions are included - you can choose to use all PC#5, or some or all of the fibers. Separate chart pack includes star button. Full fiber kit is available and includes fabric, star button and fibers (Silk n' Cream, Gold Rush, PC#5, Fancy Fur, Very Velvet, Alpaca, Cresta d' Oro, Fuzzy Stuff, Frosty Rays). Buttons are available. CBRD05 HALLOWEEN ROUND - Another in the Holiday/Season Rounds design series. 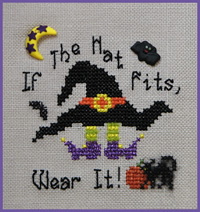 This Halloween design has black cats, witches hats and colorful stockings to brighten your Halloween season. Model done on 18 ct Lambswool Linen using #5 Perle Cotton and specialty fibers. Design size is 6.2" X 6.2'. Chart pack includes pumpkin button. Extra buttons are available. $7.00 for the chart pack. 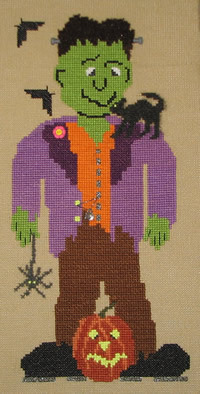 FS20 WITCHY LOU - Stitched on 9 count Linen Canvas. This design is 2.6" by 3.4" and uses: Fyreworks, Perle Cotton #3, Gold Rush, Arctic Rays, Frosty Rays, Razzle Dazzle and Retors Mat. 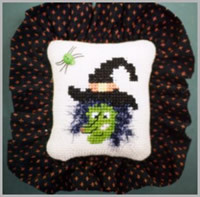 Kit includes fabric, fibers and spider button needed to complete this project. Separate chart pack includes chart and button. Extra buttons are available. $8.00 for the chart pack and $24.00 for the full kit. 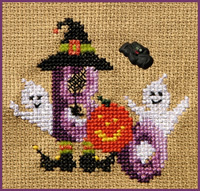 CBOT06 BATTY ABOUT CROSS-STITCH - A fun saying,"Batty about Cross Stitch", with a furry bat and a bright moon! Shown as a wall hanging or as a picture framed in a hand painted frame. Button sets are available as a bat and spider or as 3 stars. Chart price is $5.00. 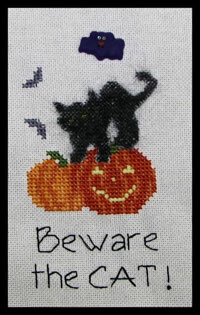 FS96 BEWARE the CAT - Our model was stitched on 25ct. Antique White using regular floss and specialty fibers. Design size is 2.7” X 4.5”. Chart pack includes bat button(s). Extra buttons are available. $8.00 for the chart pack and $24.00 for the full kit. 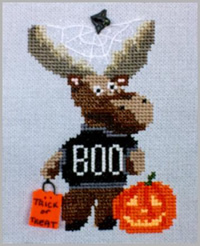 CBMC10 BOO MOOSE - From our "Malcolm the Moose" series. Malcolm has a cute scary appearance with a spider web in his antlers, "trick or treat" bag and wearing a "BOO" sweater. A bat is flying over checking out Malcolm and his pumpkin jack-o'-lantern. The bat and "trick or treat" bag buttons are available. $3.00 for the chart. 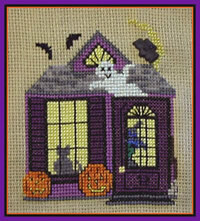 FS85 HAUNTED HOUSE - Stitched on 28 ct Summer Khaki Lugana over 2 - design size 5.0" X 5.9". Fibers used: DMC regular floss, Wisper, Kreinik Braid (glow in the dark). Kit Includes fabric, fibers and bat button. Separate chart pack includes chart and button. Extra buttons are available. $8.00 for the chart pack and $24.00 for the full kit. CT008 HAUNTED HOUSE _ Collectible Tin - This kit is packaged in a collectible tin, which has whimsical halloween scenes on the outside. 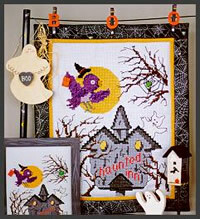 Inside the tin is a complete kit, including bat button, graph and fabric to stitch the "Haunted House" design. Extra button is available Price for the kit is $24.00. CBOT22 HAUNTED WINDOW - This scary design is a great Halloween decoration. This is the first in a series of window designs. Chart pack includes black bat button. Also available as a full fiber kit. Extra button is available. $7.00 for the chart pack and $24.00 for the full kit. 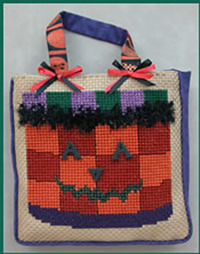 FS61 HALLOWEEN TOTE BAG - Stitched on 8 ct Sand Country Aida. This design is 5.2" by 6.8" and uses: Cresta d' Oro, Fancy Fur, Very Velvet, Sparkle Rays, PC#3, Silk & Cream. Kit Includes fabric, fibers and eyes & nose buttons for pumpkin. Separate chart pack includes chart and buttons. Extra buttons are available. $8.00 for the chart pack and $26.00 for the full kit. 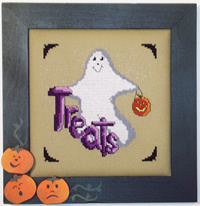 CT014 HALLOWEEN TREATS - stitched on 28 ct. New Khaki Lugana using regular floss and Kreinik braid. Design size is 5.7" X 5.5". 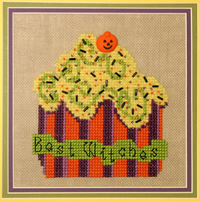 As an option, you can place a stitchworks scary black cat button on the word "Treats". Button is available from the Stitchworks. $6.00 for the chart.